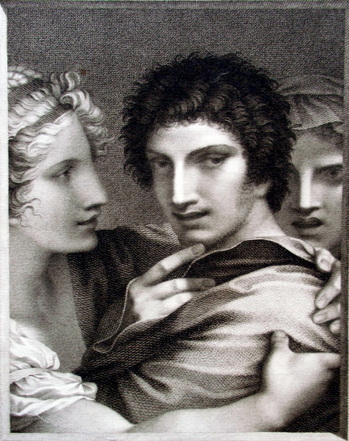 Barthélemy Roger (1767-1840) after a drawing by Pierre-Paul Prud’hon (1758-1823), La raison parle, et le plaisir entraîne (Reason Speaks and Pleasure Carries One Away), ca. 1796-1799. Stipple engraving. Goncourt 78.ii; Laveissière 80-81.36; Beraldi XI.229. Graphic Arts Collection. GA2012-02315. Gift of Mary M. Schmidt. Unlike many artists who allowed the publisher to handle the printing, publication, and sale of their work, Prud’hon kept a hand in every aspect of the process. His prints sold for as much as 7 livres (compared to the 3 livres charged for prints by Jacques-Louis David, 1748-1825). 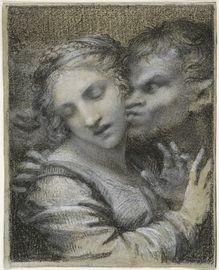 The investment and the sale of Prud’hon’s work was shared between his publisher and friend Constantin, the engraver (in this case Roger), and the artist. 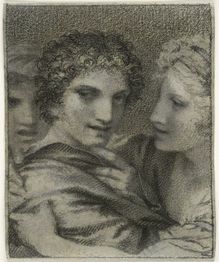 For this print, Reason Speaks and Pleasure Carries One Away (also translated Pleasure Entraps), Prud’hon made two drawings, one ink and the other in two colors of chalk. Both are in the collection of the Fogg Art Museum. It may be that the artist and the engraver were considering a two color engraving, although no example of this has been found. Also shown below is the similar Virtue Struggles with Vice.